One of the earliest forms of surface stitching, crewelwork uses a range of stitches and elements of shading using crewel wool on linen. Jacobean-style designs, developed in the 17th century were influenced by exotic flora and fauna found on imported Indian chintzes. 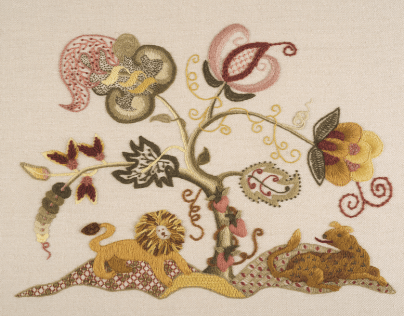 English embroiderers added insects and quirky animals to the traditional Tree of Life foliage designs. Using two main colours in tonal shades Jacobean embroidery has been popular for centuries but crewelwork stitches also work well with contempary designs. Introducing a range of stitches and an element of shading, crewelwork is an ideal technique for beginners new to embroidery. Worked in crewel wool on linen, this decorative technique is one of the earliest forms of surface stitching. Basic designs can include between six to ten crewelwork stitches and a range of colours is used for tonal accents.